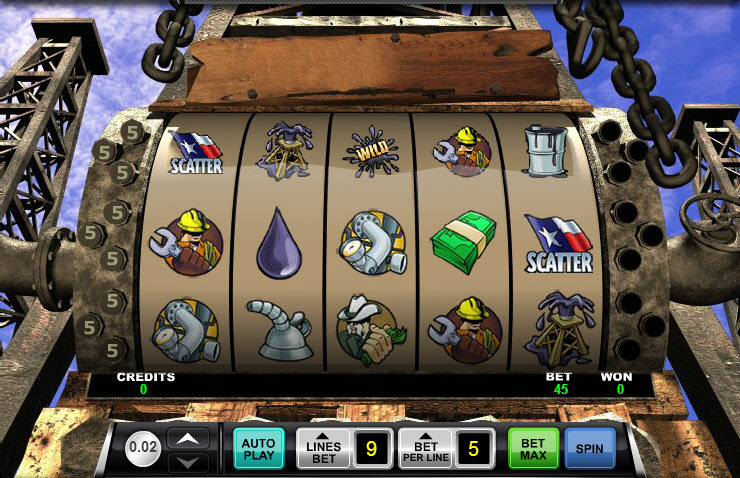 Overview: Strike it rich with Roughneck Reels, a 5-reel, 9-line slot game designed to make winners out of the blue collar workers in the oil fields. Get to work on the game's oil rig-designed screen until you hit pay dirt. 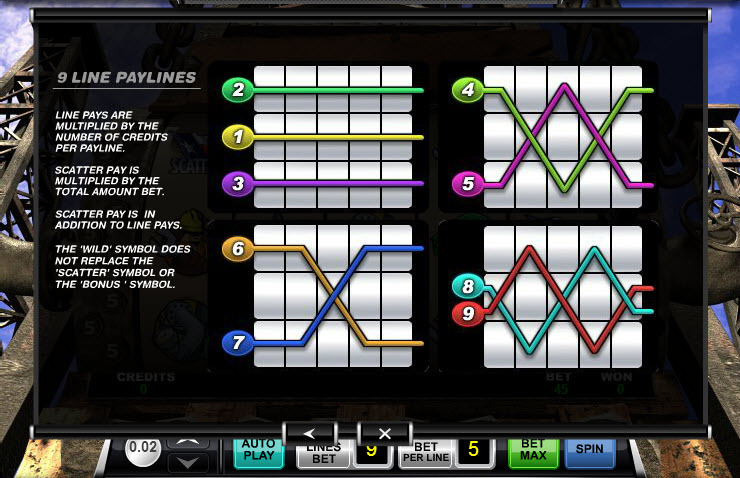 Bet 1-5 coins which have values from 0.02 to 1.0 on the maximum 9 lines, for a max bet of 45 credits. 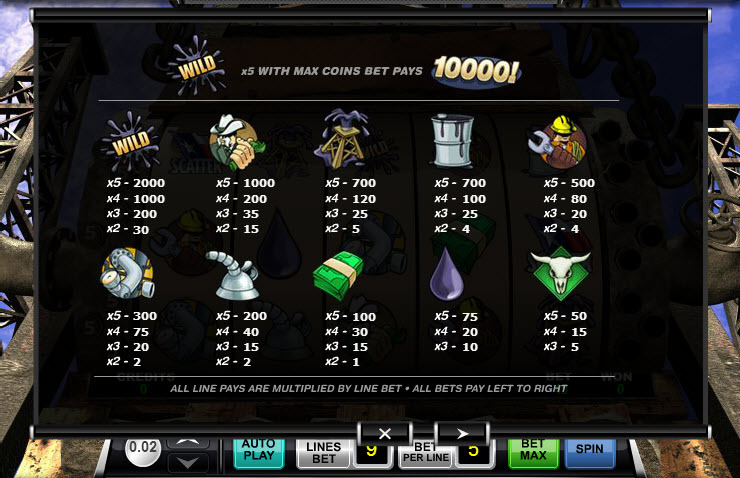 Collect 5 Wild symbols in one pay line while betting with max coins and win 10,000. Also earn credits when 3 or more Scatter symbols appear anywhere on screen. 3 symbols will pay 5 credits, 4 will pay 50 and 5 will pay 500. Those will still be multiplied by the amount of the bet per line. Try your luck with the bonus game, which will activate when 3 or more Bonus symbols appear on an active pay line. 4 bonus symbols will take you to the bonus round with a 5x multiplier, while 5 symbols will give a 25x multiplier for any bonus round winnings. Just keep clicking the 12 oil rigs to choose from and collect their corresponding credit prize. 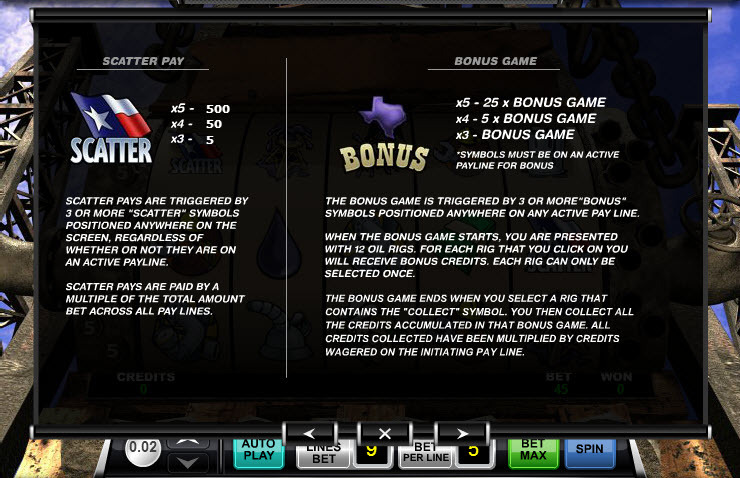 The bonus round will continue until the oil rig which reveals Collect is clicked. Similar Slots: If you like Roughneck Reels, you might like these other slot machines from Ace Gaming: Conspiracy Slot, Coral Cash, Crazy Coconuts, Fruit Fuzion, Heaven Cent.